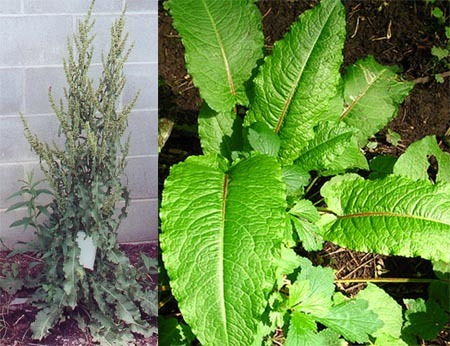 Medicinal uses: A cleansing herb that is used as a laxative to treat constipation, liver problems, and arthritis. Also used to clear chronic skin problems. In traditional medicine, the root was used as a remedy against internal parasites (tapeworm and roundworm). The whole plant is used for vascular disorders and internal bleeding. Applied externally to ulcers, boils, and tumors. Cautions: Avoid use during pregnancy and while nursing (Chevallier 264). The fresh leaves should not be eaten due to their oxalic acid content. They can be simmered in water that has been drained twice in order to leach away most of this constituent (Kowalchik 162).